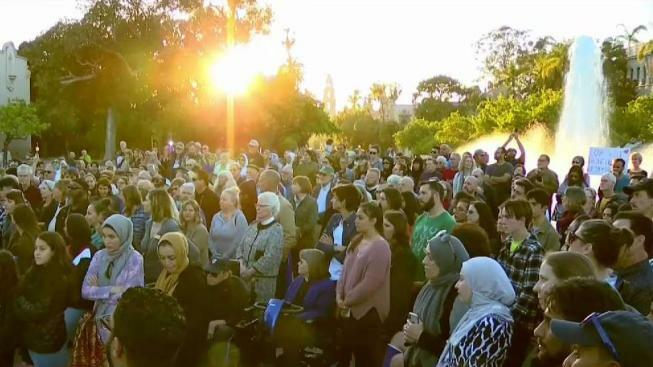 Hundreds of people gathered in Balboa Park on Sunday evening to honor the victims of the New Zealand massacre. The prayer vigil was organized by local Muslim groups, including CAIR San Diego, the Muslim Leadership Council and the Islamic Center, but people of all faiths and backgrounds turned out with a unified message to stamp out hate and gun violence. Among the mourners in Balboa Park was New Zealand native Terry Crawford. “I think the country is just torn with sadness at the moment, torn with anger,” he said. In Balboa Park, the names of the fallen were read and their stories remembered. A couple of days after the massacre, San Diego Muslims remain concerned for their own safety. “The congregation gets nervous,” said Imam Wali Fardan from Masjidul Taqwa of San Diego. Fardan, says his mosque’s security team has prepared for the possibility of an attack similar to the New Zealand shooting. “They are constantly telling us, the women say, ‘What about our security,’ and things like that,” Fardan said. During the vigil, there was a very visible police presence, including San Diego police Chief David Nisleit. Despite the sorrow, many San Diegans are hoping the tragedy in New Zealand will lead to an aggressive fight against hate and bigotry. “Maybe the small amount of good that can come of this, is that we’ll be more serious about addressing the threat white supremacy poses to the Muslim community, and the Jewish community, and communities of color,” Sami Ortoleva said.